I love dishes. Compared to some people, I have a lot; compared to other people, I don't have a lot. I don't really have a lot of expensive dishes; I just love dishes! 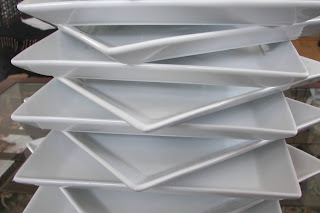 So here's the story on how I acquired ten white square dishes. Dish lovers and decorators in Utah love the store Tai Pan Trading. There are about four locations in Utah and one in Southern California. 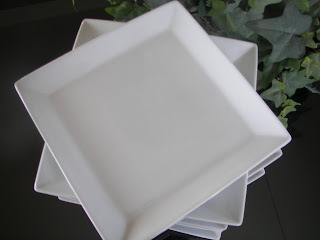 In one of my sister Jeannie's visits to Utah she bought ten square white plates. She also bought some sunny yellow plates. Obviously she is a dish lover too! Her intention was to take them on the airplane with her on her return flight to Texas. When the skycap weighed in her "dish luggage," he informed her she would have to pay one hundred dollars for her luggage! Somehow, she fit the sunny yellow plates in her other luggage. Since the white plates only cost two or three dollars per plate, she decided to leave the white plates behind. As I had taken her to the airport, I became the proud owner of ten square plates! I love them! I think they pair up well with food. They are also great used as minimalist chargers or used with Asian food. Well, you KNOW I love them! I'm Pattie and I'm a dish-oholic! Thank you for visiting me today! 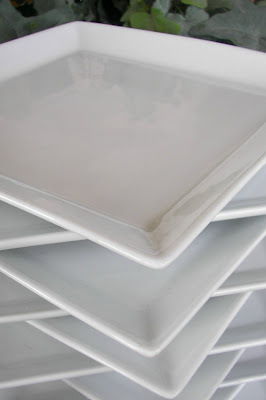 I am a dish addict, much more so since I started blogging and joining in with Tablescape Thursday. I love your white plates...you will find so many ways to use them. I seem to use my white dishes with almost every table setting. Your blog header is so cute and colorful. It is nice to meet you!